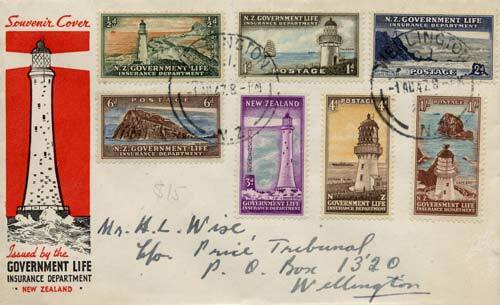 The Government Life Insurance Department was the only New Zealand government department allowed to issue its own stamps. The tradition began in 1891, and the lighthouse was used as a symbol of security, indicating the widespread public confidence in the national system of lighthouses by that time. In 1947 new stamps were issued, designed by James Berry. They featured lighthouses around the New Zealand coast – Castle Point, Taiaroa Head, Cape Palliser, Stephens Island, The Brothers and Cape Brett. The threepenny stamp featured Eddystone lighthouse on the Cornish coast, as a tribute to the British heritage.